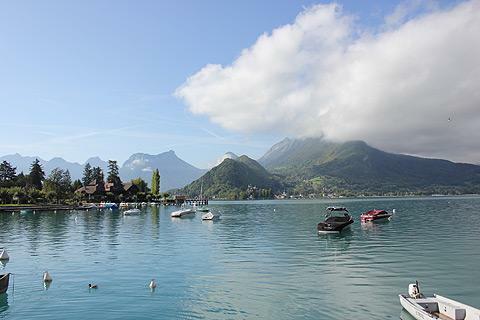 Talloires is a beautiful village on the shores of Lake Annecy. 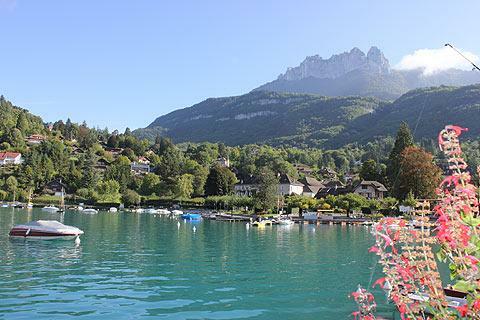 Lake Annecy is a stunning lake surrounded by mountains and its edges are dotted with attractive villages, one of the best of which is Talloires. France This Way comment: apparently Winston Churchill said that Talloires was "the most beautiful place on Earth". That might be an exaggeration but the village is very pretty and a visit is recommended. In the village centre the buildings along the main street of Talloires are typical examples of Savoy architecture. 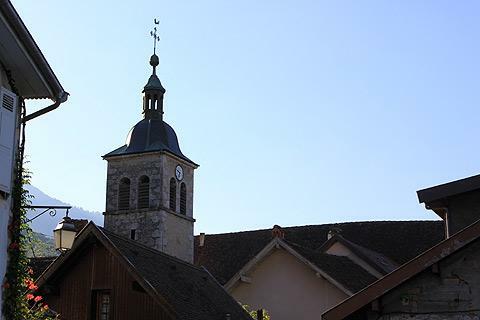 Start your visit at Talloires tourist office where you can ask for their leaflet giving a walking route through the village passing the main sights. 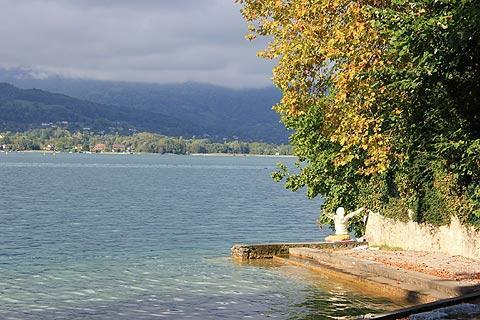 The first stop on the itinerary is the 'Chemin de Quoex', a path which leads to a small bay on the edge of the lake. This has steps down to the water allowing you to set off for a swim in the amazingly clear water. On the opposite side of the lake you can see the Chateau de Duingt. Leave this bay and continue along the lane to the harbour and you will pass the famous Pere Bise Hotel. Lots of celebrities have come to Talloires for a holiday and many have chosen the magnificent, Michelin starred Pere Bise Hotel for their stay. Past visitors include Brigitte Bardot, Charlie Chaplin and the Queen Mother of England. 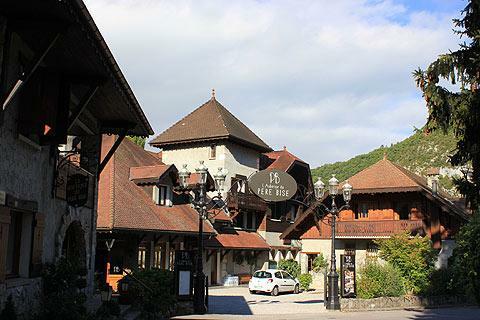 Another famous hotel in the village is the Abbaye de Talloires: its famous visitors include Mark Twain, Paul Cezanne, Jean Reno and Bruce Willis. 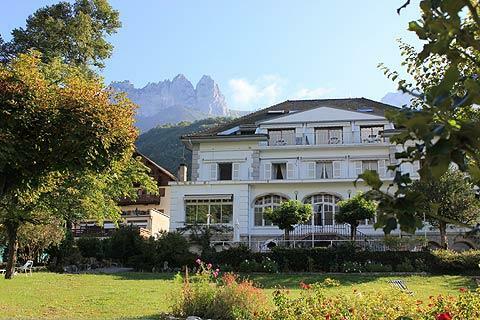 If you are looking for a gourmet visit to Talloires then there are a number of excellent hotels and restaurants allowing you to eat a superb meal somewhere different each night. If you walk along the edge of the lake you reach the abbey which often hosts art exhibitions and concerts: the abbey began as a chapel and later developed into a monastery. The 17th century Abbey is now a 4* hotel. Leaving the lake on the Chemin de la Colombiere you will be surprised to reach the Tufts University of Boston! This is housed in a former Benedictine Priory and is the university's European centre. There are a number of water based sports including: stand up paddling (this has come from Hawaii and is becoming quite popular in France), waterskiing and wakeboarding, diving (Lake Annecy is one of the cleanest lakes in Europe and so visibility is excellent) and Talloires has a beach with a life-guard if you fancy a swim. You can also go canyoning or paragliding in the area around Talloires. 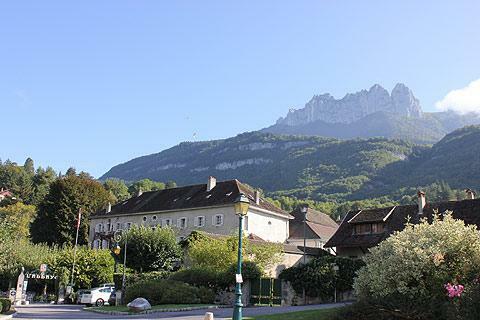 The lake scenery really is magnificent with its views across to mountains, the Chateau de Duingt and the other villages dotted around the lake. 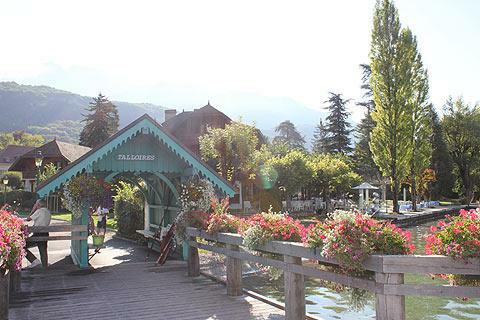 The brightly coloured 'boat-stop' on the lake's edge is charming and from here you can catch a boat to the other villages on the shores of Lake Annecy. 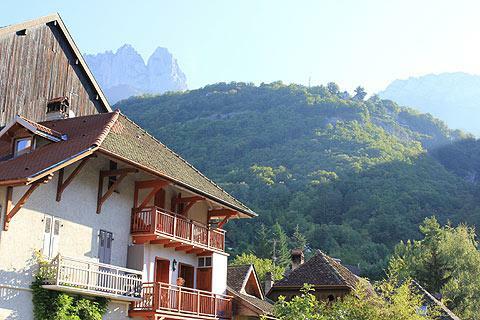 There are many natural highlights in the surrounding region, and again the tourist office in Talloires is the best place to start. The hills above the village are topped by unusual craggy rocks called the Dents de Lanfon, or 'teeth of Lanfon' and the Roc de Chere is an immense rock with great views over the lake. Part of it is a nature reserve with a wide diversity of plant-life. In the hamlet of Angon you can see an impressive waterfall. The Chateau de Menthon started life as a medieval fortress and has been converted into a luxury castle. It is open for visits in the July and August and Friday, Saturday and Sundays in May, June and September (afternoons only).